The ultimate goal of the Moore Heritage Project is to publish a comprehensive family history book that tells the story of our family legacy, honors our ancestors, and preserves our rich heritage for future generations. “An American Journey: The Ancestors, Descendants, and Lives of Joel Marvin Moore & Eudora Adeline Beauchamp” will take a detailed look into the Moore and Beauchamp families, tracing their migration to the British Colonies just before the birth of a new nation, through the westward expansion, and to the end of the 21st century. When complete, “An American Journey” will be a comprehensive account of nearly 275 years of Moore and Beauchamp family history in America. The book will be a detailed narrative that will include photos, maps, and charts to help illustrate the story of the ancestors, descendants, and lives of Joel Marvin Moore & Eudora Adeline Beauchamp. 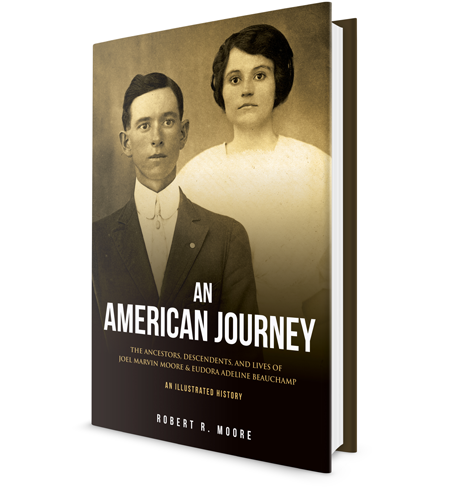 “An American Journey” is currently being written, edited, and developed with the goal of making the book available to the Moore and Beauchamp families in 2017. More than just a record of names and dates, this project will serve as a testament to the kind of people we were, where we've been, what we were like, and what we've been through.